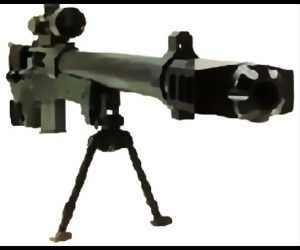 The L96A1 is the British Army designation of the standard AWC PM, and is the standard Sniper rifle for the British Army. The L96A1 utilises an aluminium frame over which is placed a high impact plastic stock. An adjustable Parker Hale Bi-Pod is fitted as standard. An uprated version, the AW ( imported to the US by Accuracy International), features many minor improvements, including an easier bolt action, frost proof mechanism, muzzle brake and a 10 X 42 "Hensoldt" telescopic sight. The L96A1 is capable of sub MOA (Minutes of Angle) with military ammo, and gets to about half of that, with good match grade ammo. Models in common use are the "PM Counter-Terrorist Sniper" Rifle, "PM Covert Sniper Rifle", and the "PM Super Magnum (Silenced) Sniper" Rifle. For "Hard Target Interdiction" - The L96A1 AW Magnum 50 rifle was constructed on the same design and ergonomic principles as the other rifles in the L96A1 family and is constructed to function reliably with all the various natures of commercial and ex-military stock .50 BMG ammunition. Features include a built-in anti-recoil system and an adjustable third supporting leg to help precision in aiming, as well as a folding stock and a total weight (minus ammo) of 16Kg (35 lbs).